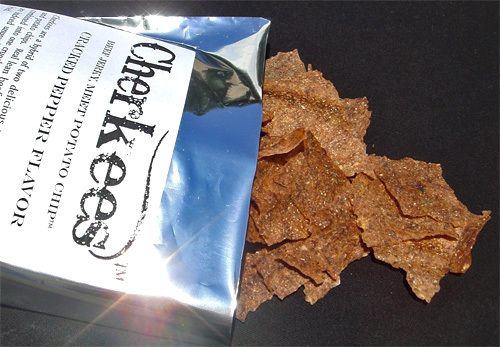 Cherkees – Potato Chips Meet Beef Jerky | OhGizmo! By Andrew Liszewski on 09/27/11 • Leave a comment! It turns out I can scratch ‘Invent a snack that will be the end of mankind’ off my bucket list. Because a company called Rowan Lane has beaten me to it. As a product name, Cherkees doesn’t exactly roll off the tongue like, say, Ruffles or Doritos. But it makes up for that marketing shortcoming by being possibly one of the most amazing snacks man has ever created. Regular beef jerky isn’t the easiest thing to snack on outside of a survival situation. And beef jerky flavored chips never taste as authentic as the real thing. So in a move that would probably baffle even Einstein, they pushed mother nature aside, threw caution to the wind, and combined the two together. Each bag of Cherkees contains over a quarter pound of lean beef combined with traditional potato chips. And since they’re not fried, they have about 1/3 as much fat as your typical bag of chips. With loads more protein. At the moment they come in two flavors—Cracked Pepper and Hot Pepper—with Teriyaki and Smokehouse being available sometime in the future. And even though they’re a bit more expensive than a traditional bag of chips—$4.99 for 2.8 oz. and $9.99 for 5.8 oz.— they’re still currently sold out due to the demand.